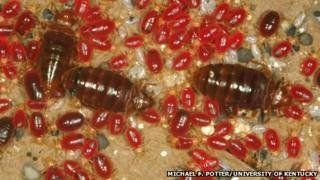 Bed bugs use a range of tactics to render insecticides useless, a study suggests. Infestations are on the rise around the world, but the pests are growing resistant to some chemicals. Now scientists have found 14 genes associated with a number of biological changes. These include the development of a thicker skin that stops poisons from penetrating, and mutations that prevent toxins from hitting the nervous system. The study, published in the journal Scientific Reports, also suggests that some of the bugs are producing higher levels of enzymes that help to metabolise insecticides more quickly. Others genes are associated with proteins that interfere with the way the deadly chemicals are carried around the bed bugs' bodies. Subba Palli, professor entomology from the University of Kentucky in the US and an author of the study, said that the hardy insects were using a combination of these molecular tricks. "Some used four different mechanisms, some three and so on," he explained. "Bed bugs are employing more than one mechanism of resistance to avoid insecticide toxicity." Bed bugs are present all over the globe, but in recent years Europe, the US, Canada and Australia have seen a huge influx of them. The insects feast on the blood of their sleeping victims, leaving itchy, red welts as a calling card. They are one of the toughest pests to get rid of. Vacating your bed - or even home - will not help, as the insects can survive for months without food, hiding away until their meal returns. Direct exposure to insecticides - the most widely used are synthetic organic compounds called pyrethroids - was once an effective way to kill off the pests. But not any more. Prof Palli said that the bed bugs had developed a number of biological systems to avoid death by poison. Studying 21 populations of insects, which had been collected from infested apartments close to the university, the team discovered that the genes associated with resistance to pyrethroids were located in the bed bugs' tough outer shell. "We are hypothesising that having these genes expressed in the epidermis will provide a first line of defence as insecticides penetrate the skin," he explained. The team said that the findings could help scientists to develop new, more effective chemicals. These could bypass the bed bugs' molecular armoury or work by interfering with the genes associated with insecticide resistance. But until these are created, exterminators are having to resort to other means to beat the bugs. Prof Palli explained: "In places like India, they are not treated as huge problem pests... People drag their furniture out into the Sun... and the bugs will crawl out and die from the heat." Now in the US, he explained, exterminators are employing similar tactics when confronted with the worst infestations. "The best option now is to heat the place up to 90-100F (30-35C) so that the bugs will come out and die," he explained. "They take all of the furniture out, and they heat up the house. That seems to be the way to exterminate them if the infestation is bad."